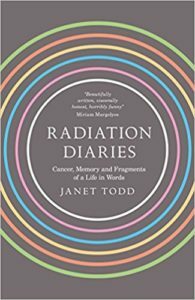 Radiation Diaries tells of a month of radiotherapy treatment undergone when Janet Todd was president of a Cambridge college and while her father, in his 100th year, was approaching death, with skin cancer. The day-by-day treatment brought into her mind flashes from her early life in Bermuda and Ceylon with her father, in Ghana and Puerto Rico, as a young woman, along with stored poems from childhood. Written each morning and night, it tells of the terror she induced in herself with insomniac nights on the web, searching out percentages of recoveries and death, of alternative treatments. Her reactions will be common to others who spend time in hospital-land. Todd’s experiences and writings will inspire and help others with these illness and treatments, and those who care for them. Unflinching in detail, Radiation Diaries will strike chords for anyone who has suffered a life-threatening illness, but the book’s message is positive, for the author lives well and has a new career. Now 75, she completed her term as President of a Cambridge college, while ill, published further books and became a grandmother. Now she maintains her academic career with speeches and lectures, has become a novelist, and travelled to launch her fiction in US and the UK, while still recovering. Surrounded by family and friends, she continues her peripatetic existence, albeit more by creative work from her imagination and via computer than by frequent exotic travels to the places she has lived and taught. 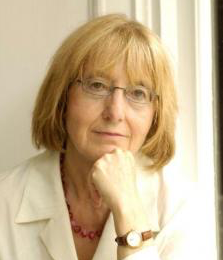 “Janet Todd turns her renowned literary intelligence to her experience as a cancer patient. Original, forceful and often funny, there is no other cancer diary like it. The book’s clear-eyed detail is a reminder that indignity, pain and fear do not diminish memory, imagination or the self.” Terri Apter, psychologist and author of Passing Judgment: Praise and Blame in Everyday Life.